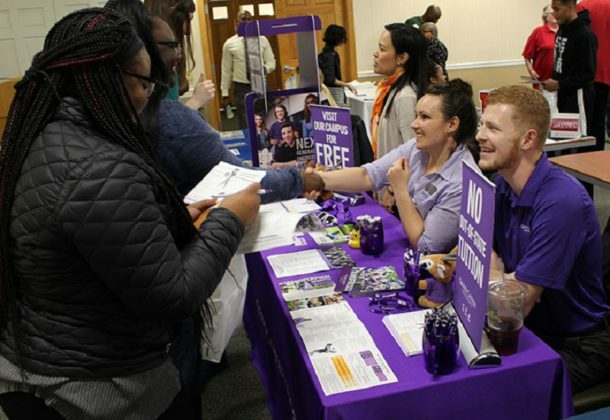 The College of Southern Maryland will offer transfer fairs so students can meet representatives from a variety of colleges and universities, explore college majors, degree programs, and meet with CSM faculty all in one place. Get your questions answered and plan your future. This is a must-attend event for all students motivated to go beyond. 10:30 am to 1:30 pm Tuesday, Feb. 19, on the La Plata Campus, Center for Business and Industry (BI Building), Room 113/113E, 8730 Mitchell Road, La Plata. 2 to 4 pm Tuesday, Feb. 19, on the Leonardtown Campus, Wellness and Aquatic Center (Building D), Lobby, 2950 Hollywood Road, Leonardtown. 10 am to noon Thursday, Feb. 21, on the Prince Frederick Campus, Building B, Multipurpose Room, 15 J.W. Williams Road, Prince Frederick. American Public University System, Bowie State University, Capitol College, Coppin State University, Coppin State University School of Nursing, Delaware State University, East Carolina University, Embry Riddle Aeronautical University, Excelsior College, Fashion Institute of Design and Merchandising, Frostburg State University, George Mason University, Grand Canyon University, Hood College, Longwood University, Mount Saint Mary’s University, Notre Dame of Maryland University, Penn State University, St. Mary’s College of Maryland, Salisbury University School of Social Work, Southern Maryland Higher Education Center, Stevenson University, University of Baltimore, University of Maryland Baltimore County, University of Maryland College Park, University of Maryland Eastern Shore, University of Maryland College Park Pre Transfer Advising, University of Maryland University College, University System of Maryland ARTSYS, University of Phoenix, Virginia Commonwealth University, Webster University, and Wilmington University. CSM has more than 60 guaranteed transfer agreements with four-year colleges and universities across the country. Discover what doors an education at CSM will open for you. Learn more about the transfer process at the college’s website. More than 1,778 CSM students transferred to 260 different colleges and universities in 44 states and the District of Columbia in 2017. If you’re curious about how to follow in their footsteps, the college has the resources to help answer your questions.